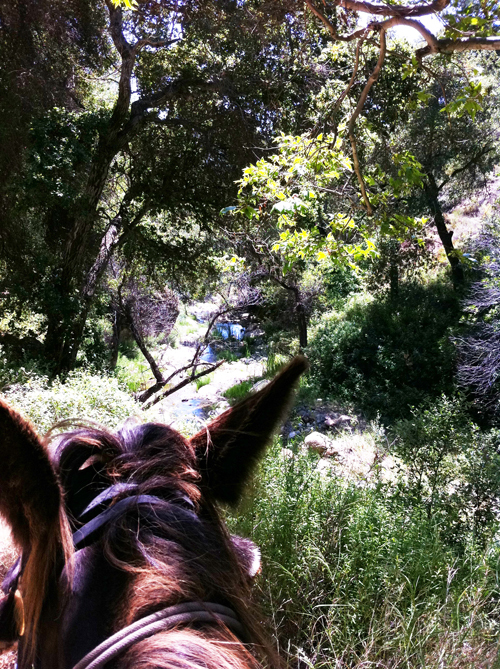 A ride from the Sage Hill campground on Paradise Road on the Santa Ynez river, behind Santa Barbara, Southern California. Up and across the spine of the Aliso Loop, then going above the Upper Oso camp to the Santa Cruz Trail, back to the 19 Oaks campground, then circling back down through Upper and Lower Oso to Sage Hill. 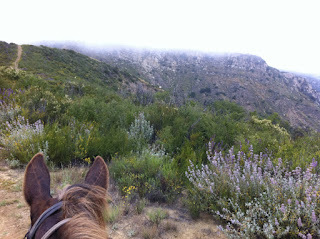 Moderate from Sage Hill to Upper Oso. 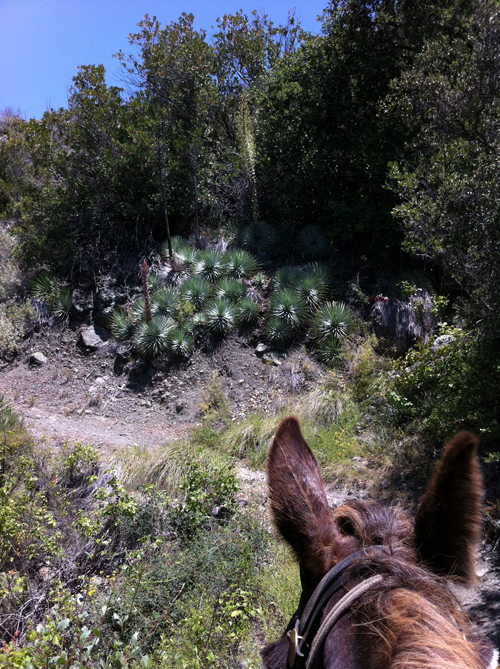 Some areas single file, rocky track, overgrown brush, moderate climbs. 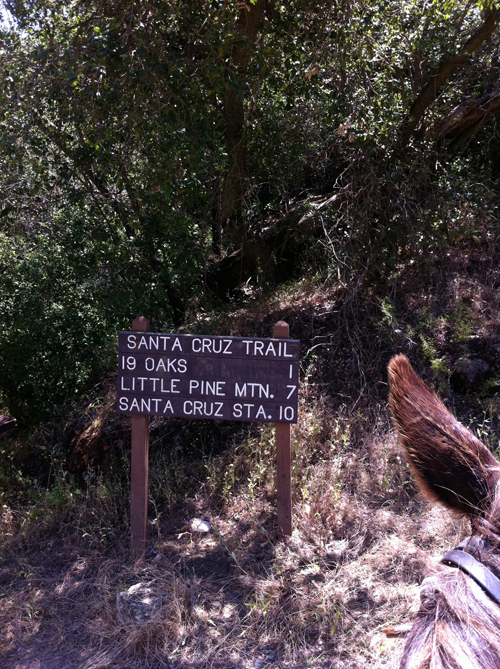 Strenuous on the Santa Cruz trail. 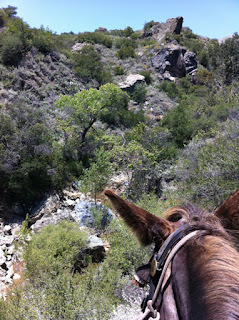 Single file, loose shale, narrow tread with drop-offs, steep climbs. 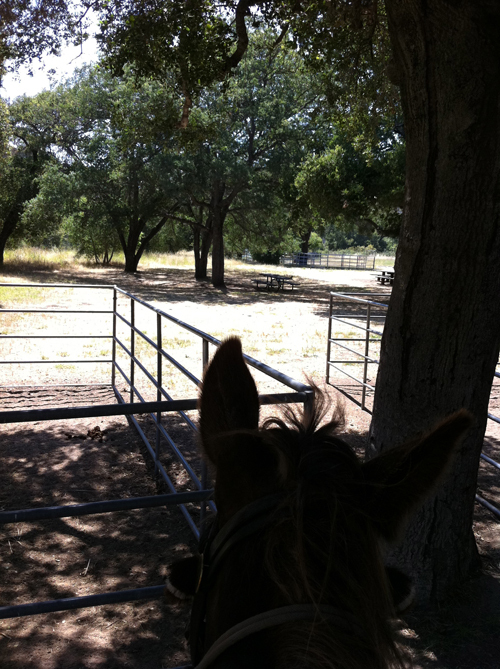 Our starting point is the corrals at Sage Hill campground. They are only rented by the Forest Service to large groups, for a set fee for all the paddocks and spaces. Heading up the hill begins with an easy slope and rise, coming up from the Santa Ynez River and heading into the front country mountains. 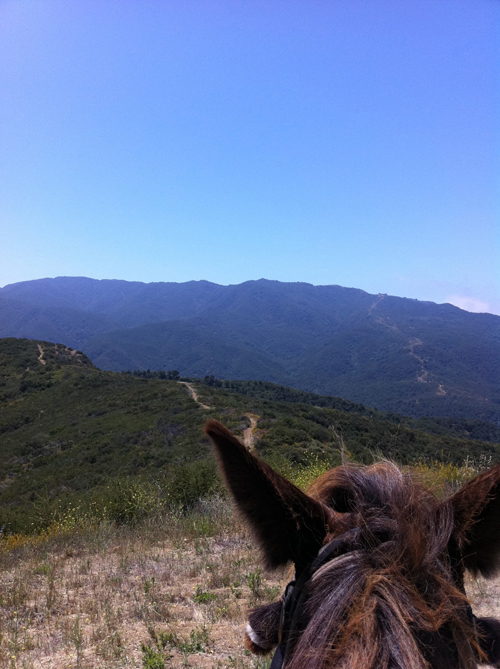 The goal rises above, and we are ready to conquer the climb. The spring flowers, sage and wooly blue curls, scent the air as we rise into a misty day. 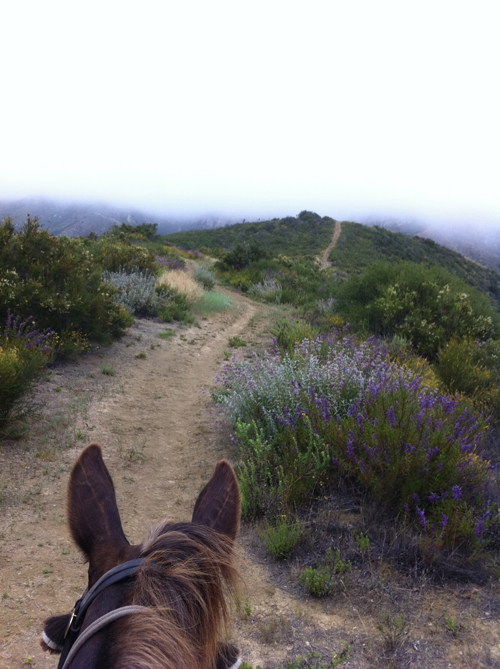 The tops of the mountains are obscured in clouds while the trail is a bright summer afternoon. Hillsides facing away from the sea are grasslands. 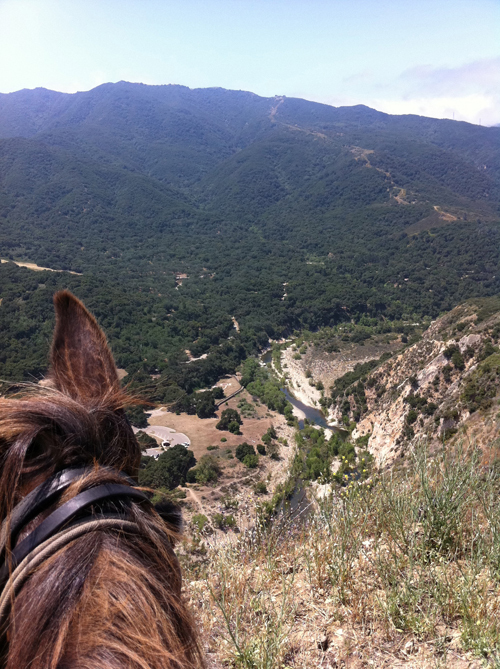 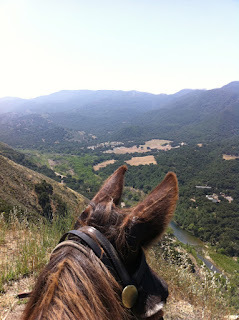 Looking down from the ridge crest at the Santa Ynez River and Rancho Oso below. Looking further downriver, and the Snyder Trail up to Knapp's Castle is clearly visible on the right, winding up to Camino Cielo at the top. 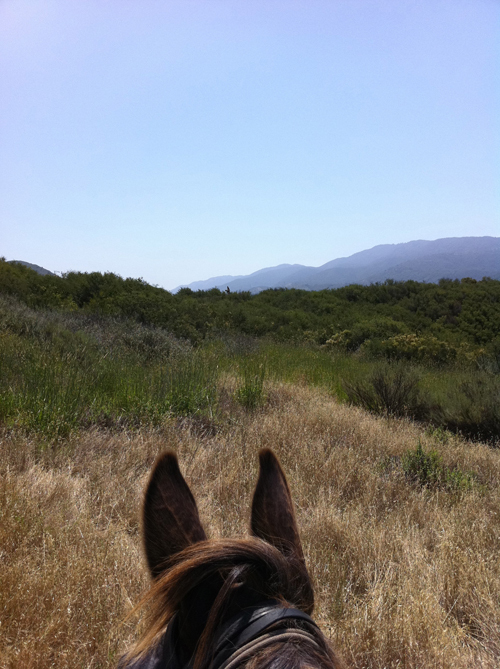 Looking inland the uninhabited part of California comes into focus. 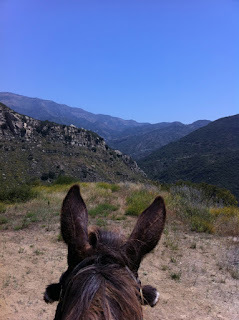 Miles and miles of backcountry mountains. 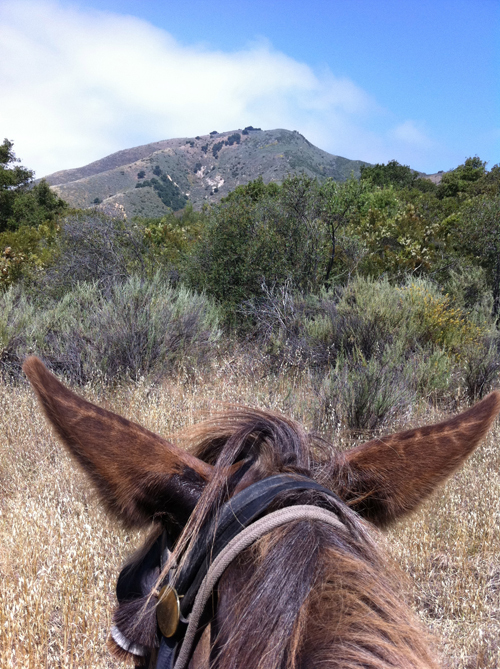 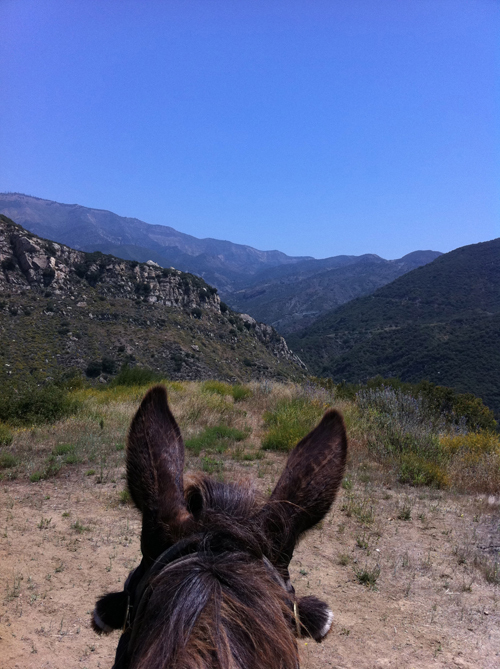 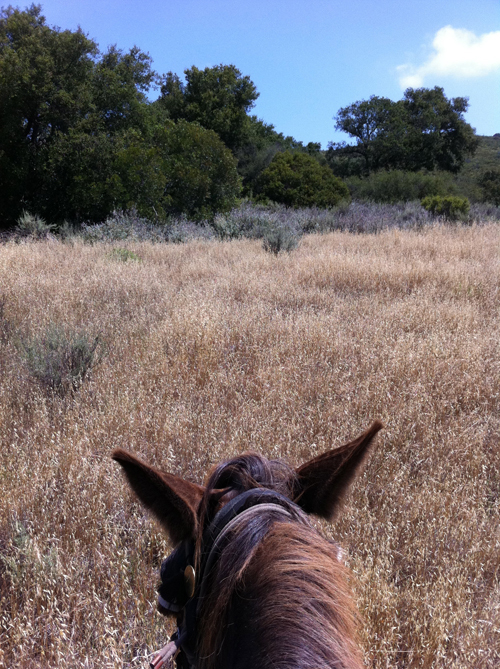 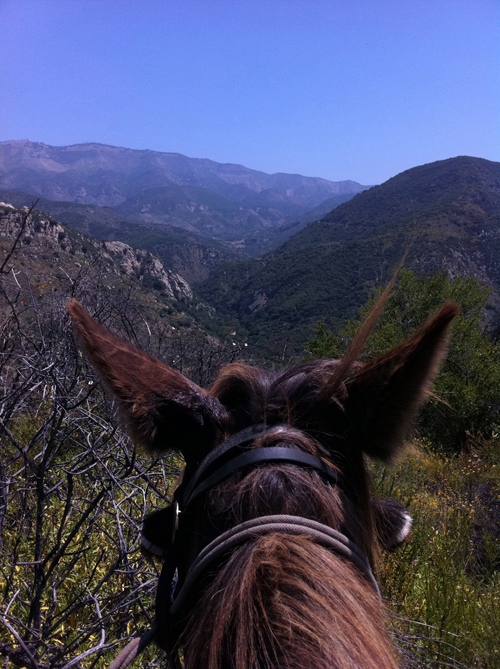 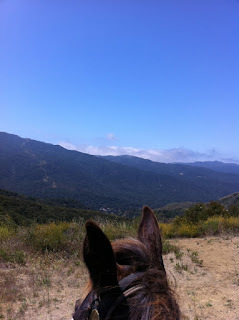 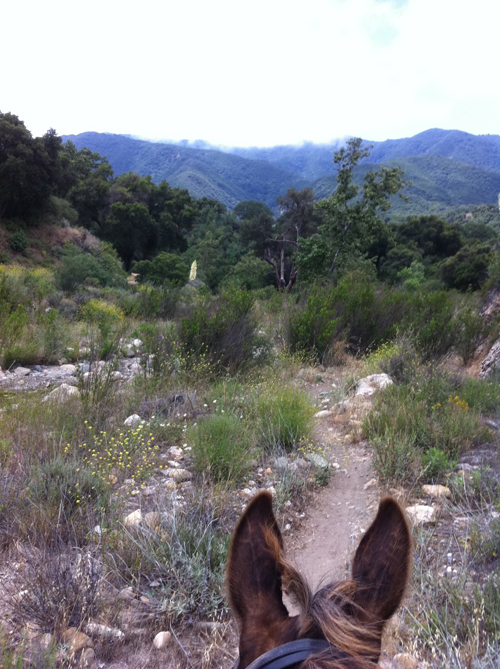 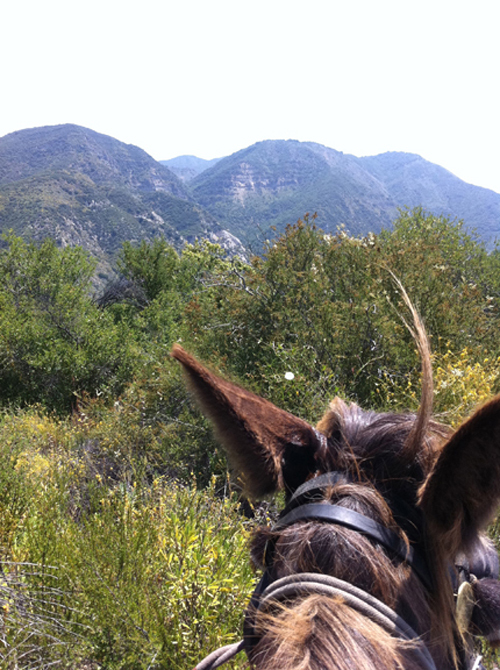 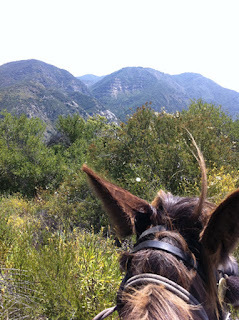 But our adventure today is frontcountry, where the chaparral smells heavenly and the trail leads ever upward. From a resting point on the ridge crest we survey the wisps of clouds that indicate the marine layer over the coast. 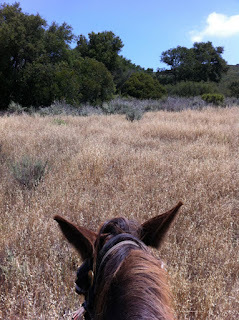 The trail cuts through the low sage scrub, snaking along the spine of the land. 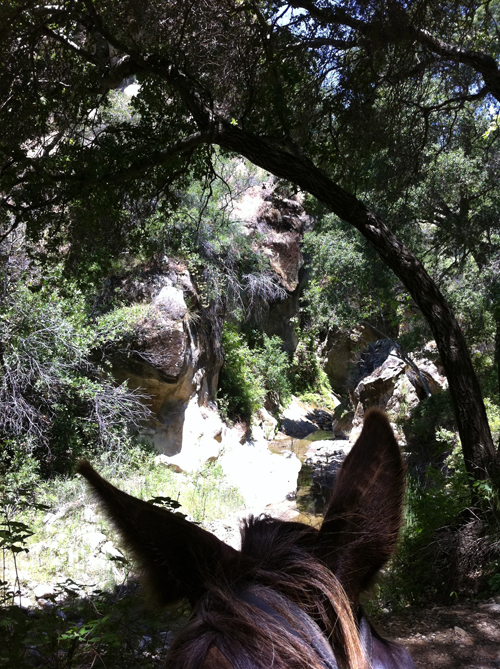 Dramatic geological formations rise on the edge of the next canyon. 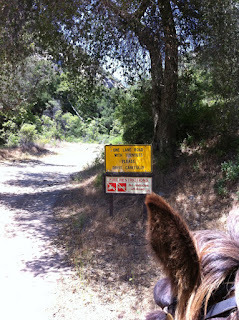 The idea of taking that canyon up is proposed, and accepted. 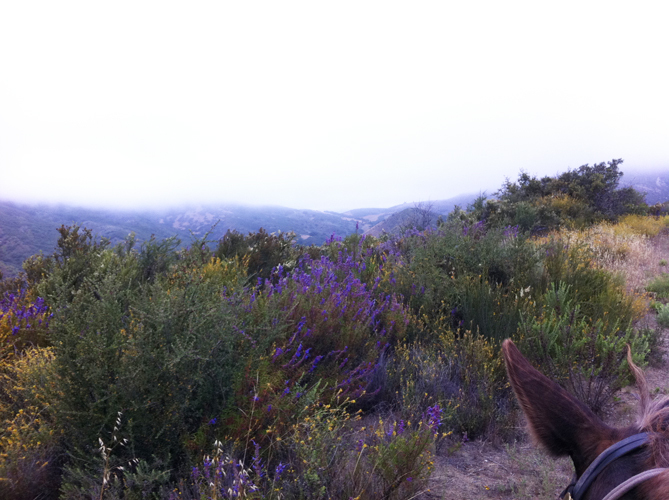 A complete change of scenery and topography. We opt to take the Santa Cruz trail up to the turn-off to 19 Oaks campground. The rock formations immediately become more dramatic, and strata in the rock tell of volcanic upheavals in forgotten times. Clusters of yuccas dot the hillsides with their light lancing leaves. 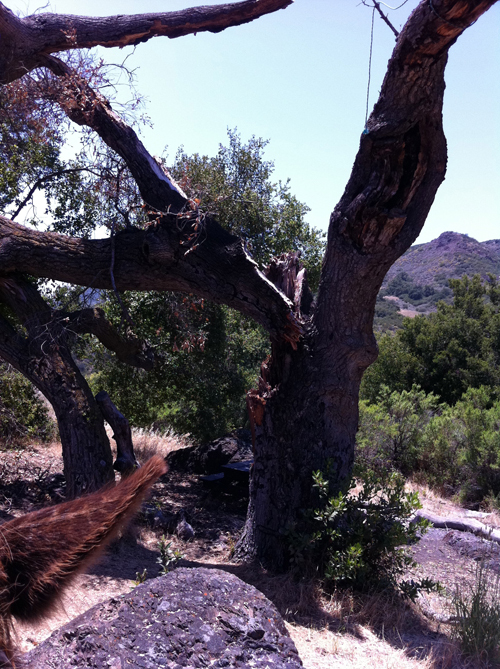 We discover that the death of this patriarch will require the renaming of the camp to "18 Oaks." It almost looked like it had been struck by lightning, but probably just succumbed to age and split in half. 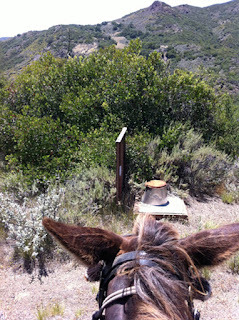 Whoever built this single bucket outhouse on the edge of the campground was concerned only about privacy from one side. Descending once again into the canyon, with rushing waters in the creek below. 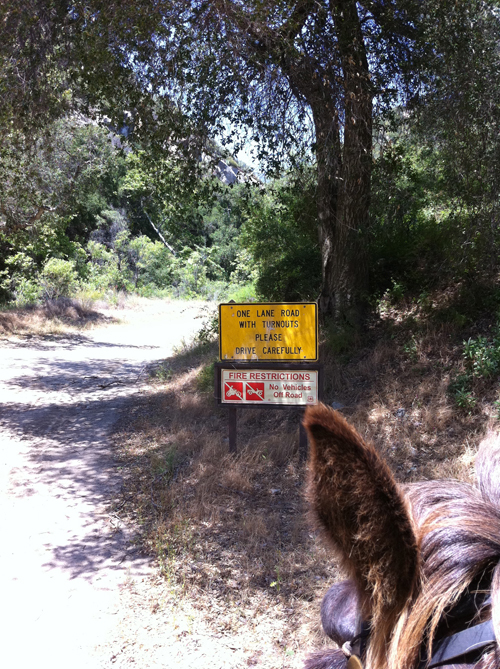 This is a road used by vehicles and bicycles but currently the road is closed off way below, so we were able to travel with no concern. Once again out of the canyon and into the coastal sage scrubland and floral display. 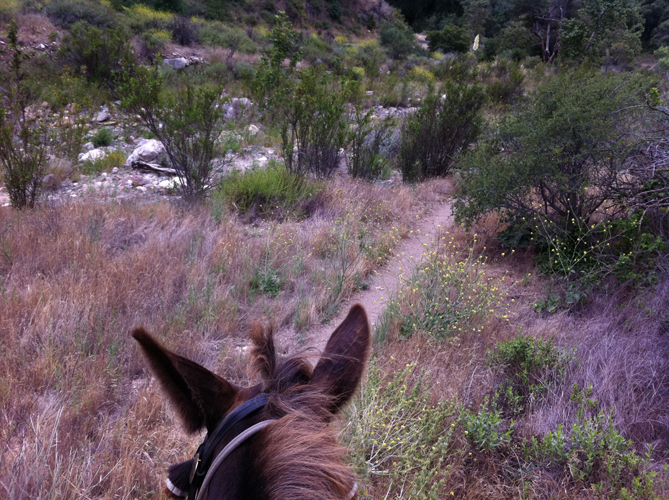 Back down to the creekbed feeding down into the river. 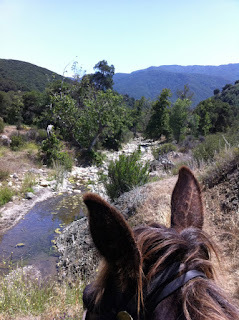 Water crossings everywhere, a gift to the thirsty mule. 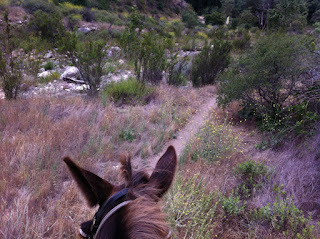 Back to the sandy trails along the river, all showing much evidence of raging waters this last winter, scouring the area clear of debris, leaving only rocks and sand and the persistent hardy plants. 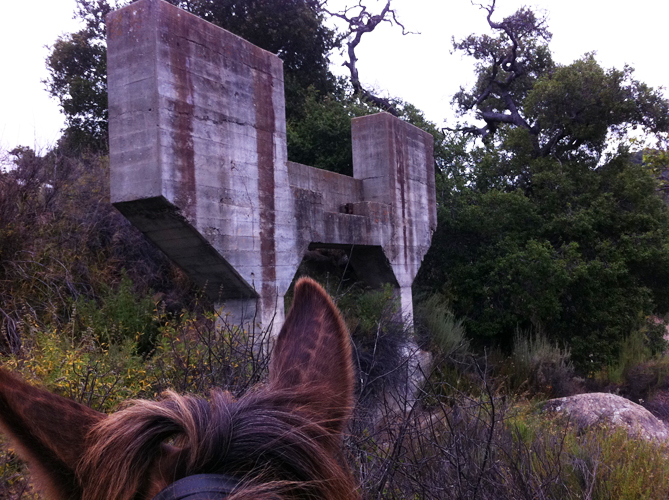 And the last mystery of the day, a monolithic structure seemingly with no purpose. 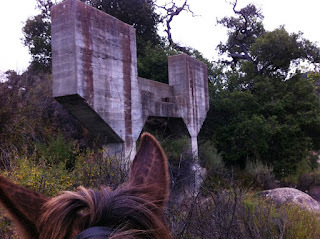 There is nothing similar nearby to suggest this might have once supported a massive bridge across the river, so we will just call it art.